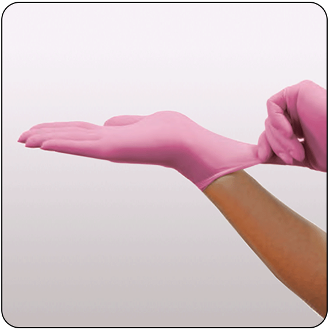 Help fight breast cancer with your purchase of Pink Vinyl Exam Gloves. Vinyl gloves are latex and powder free. This product is available as single boxes of 100 or as cases (10 boxes per case) and in 3 sizes. • Portion of sales is donated to the National Breast Cancer Foundation. • Limited strength and chemical resistance. • Low to medium elasticity with moderate flexibility.